Have you heard the term “SEP” going around? Are you wondering what it is? An SEP is a Special Enrollment Period that allows you to enroll in and/or make changes to your Health Insurance Plan outside of the Annual Enrollment Period. Without a qualifying, life-changing event, it is impossible to purchase health coverage in the United States. So what counts as a qualifying event? It depends on if you are eligible for Medicare or a Major Medical insurance policy. You typically have 60 days to make changes to your plans but the sooner the better. Once your time has elapsed, you will have to wait until the next Annual Enrollment Period or another life-qualifying event before you have another chance for change. 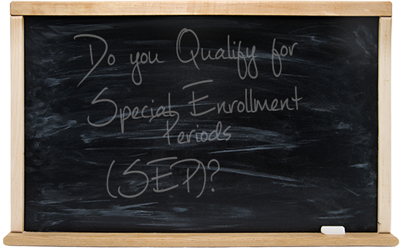 Great article on Special Enrollment Periods. Very well written.